Hurricane Maria could lead Puerto Rico’s electric utility PREPA to privatize. The indebted island was already eager to hand its electric utility to private owners. Hurricane Maria just made it much more likely. 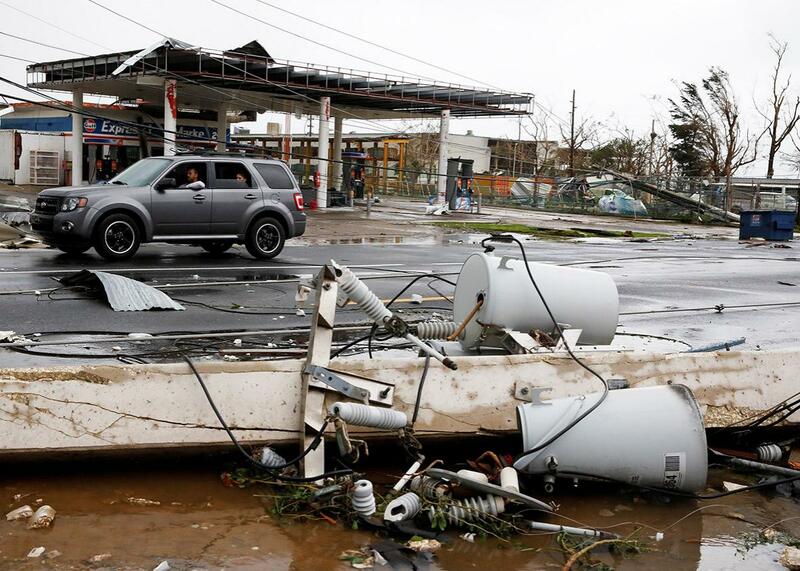 Electrical infrastructure in Guayama, Puerto Rico, devastated by Hurricane Maria. When Hurricane Irma swept through South Florida on Sept. 10, about 4.5 million homes lost power in an extended blackout. In the days afterward, eight people died of heat-related causes at a nursing home without power in Hollywood, Florida. Floridians directed their outrage at Florida Power and Light, one of the state’s private regulated utilities, which was accused of shorting resilience spending as profits rose year after year. Ten days later, the blow that Hurricane Maria has delivered to Puerto Rico made Irma’s impact on Florida look like a spring shower. Meanwhile, the service, management, and upkeep of the Puerto Rico Electric Power Authority, or PREPA, makes Florida Power and Light look like Amazon. A 2016 report on PREPA commissioned by the Puerto Rican government is scathing. In the latter months of that year, for example, Puerto Ricans experienced four to five times the number of service outages as U.S. customers on average, though they pay the second-highest rates in the U.S. after Hawaii. Instead of investing in preventive maintenance, PREPA operates in a permanent state of triage. Its budget is “opaque and discretionary.” Record keeping is “subpar.” A third of the capital budget is spend on discretionary administrative expenses, hinting at a slush fund. Thirty percent of PREPA’s employees have retired or migrated to the mainland since 2012, the Washington Post reports—especially its skilled workers. Money is short, the report concludes, but so is human and intellectual capital. The agency has $9 billion in debt and said it needs $4 billion to upgrade its infrastructure, including plants whose reliance on oil is passed onto Puerto Ricans in the form of high rates and dirty air. It filed for bankruptcy in July. And that was before a Category 5 hurricane pounded the island this week. Maria has left apocalyptic scenes on Puerto Rico, where 150 mph winds stripped whole hillsides bare of leaves and toppled concrete power-line poles. Precipitation rivaled global records, and river flows obliterated previous highs. Parts of the island received the sum of Hurricane Harvey’s three-day Houston rainfall in less than 24 hours—a year’s worth of Seattle precipitation in just a day, as the meteorologist Eric Holthaus noted. PREPA director Ricardo Ramos said the power grid has been “destroyed.” Puerto Rico Gov. Ricardo Rosselló told Anderson Cooper it would take months to restore electricity to the island’s 3.5 million residents. It’s a task made more complicated by the fact that PREPA has become a political football, a problem symptomatic both of Puerto Rico’s economic crisis and the controversial Washington-run political system in place to manage the island, including its maligned power corporation. The island has spent more than a decade in recession. Unemployment is more than 10 percent, and the population declined by more than 10 percent between 2004 and 2016. In 2015 alone, the net outward migration was more than 64,000, according to Pew. Six in 10 children live in poverty. In May, Puerto Rico filed for bankruptcy under the provisions set forth in PROMESA (Puerto Rico Oversight, Management, and Economic Stability Act), a law signed by President Obama in the summer of 2016. The act established a financial control board for the island, similar to the emergency managers that have governed Detroit and other American cities in the wake of bankruptcies. But this summer, the financial control board did something surprisingly wise, much to the disappointment of the congressional Republicans who created it: It voted 4–3 to reject a restructuring agreement for the power authority’s $9 billion in debt, infuriating the hedge funds that had negotiated a repayment deal to recoup 85 percent of what they were owed. The board’s idea is to privatize PREPA. “Lowering the price of electricity and spurring economic growth depended on reforming Prepa’s operations, not merely restructuring its credit,” the four members who had rejected the debt deal wrote in a Wall Street Journal op-ed. Privatization would allow PREPA to “modernize its power supply, depoliticize its management, reform pensions, and renegotiate labor and other contracts to operate more efficiently.” Most importantly, they wrote, no new investment will come into PREPA’s plants, transformers, and lines if Puerto Rico ratepayers are spending the next three decades paying off debt to vulture funds in New York. This plan has made unlikely allies of New York bankers and Puerto Rican labor unions. Union officials are convinced PREPA chiefs are deliberately letting the system fall apart to strengthen the case for privatization, which the island’s governor declared was inevitable before the hurricanes hit. Unions believe their contracts and pensions are safer with elected politicians than with independent business leaders. The banks, which sued the fiscal control board and lost, should be worried that PREPA’s assets could be sold off for a song in order to get a private operator invested in the island’s power system. They’ll wind up getting paid less, and later, than will newer investors eager to rebuild the island’s infrastructure. Their goal—getting paid for years to come by Puerto Ricans on their electricity bills—is at odds with the fiscal control board’s goal of making the island’s electricity cheaper. PREPA has played up the extent to which recent funding shortfalls (during the control board era and before) have precipitated the crisis. Ramos, PREPA’s executive director, noted before Irma that the utility’s plants were vulnerable because no money had been spent on maintenance. Miguel A. Soto-Class, the president of the Center for a New Economy, a Puerto Rican research group, told the New York Times that a lack of tree pruning (again, to save money) had left the country’s 2,478 miles of transmission lines and 31,485 miles of distribution lines vulnerable to a storm. “PREPA’s current weak financial condition will affect the utility’s ability to quickly repair and restore service after this natural disaster,” Moody’s wrote in early September, before Irma. Now a disaster has struck that is worse than what anyone had imagined; damage will likely cost hundreds of millions to repair, even as the future of PREPA—including such basic questions as its ownership—remains tangled up in politics. “This is a moment of crisis that we need to benefit from and transform into an opportunity of change, production and investment,” Jenniffer González, the island’s nonvoting representative in Congress, told the New York Times after Irma. This wouldn’t be the first disaster to ease the way toward privatization. Selling off public assets has never been popular in Puerto Rico, but less popular still, in the wake of Hurricane Maria, will be a dysfunctional PREPA that can’t turn the lights on.